Convenient Dental is a friendly, fun and bright place that makes you feel right at home. Our team is ready to greet you, making sure that you feel relaxed and at ease. We want to give you the best dental experience you’ve ever had, and we show each of our patients the respect they deserve. Please bring your insurance card and identification in with you. We take many types of insurance and are in-network providers with some. Our team will get your coverage information from you over the phone when you schedule. Your benefits will be checked for you by the time you come in. We also offer in-house payment plans. When you arrive for your first dental appointment, we’ll ask you to fill out some paperwork. You’ll then meet Dr. Viji who will sit down to chat with you. We want to get to know you before getting started, and our patients enjoy the personal touch we bring to their dental care. 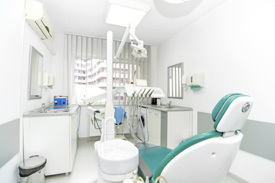 Any X-rays that are needed to understand your oral health will be taken. Then, we’ll perform a clinical evaluation of your teeth and mouth. We don’t have a hygienist, so all of your treatment is given to you one-on-one by Dr. Viji. If you came in for a cleaning, we’ll proceed with that. Future treatment may be required. If so, we will discuss these options with you and set up any future appointments. You’ll also be given all cost information so that you know exactly what to expect. We offer convenient late appointments and dental financing. Contact us today to schedule a time! Free parking is available on-site.